Mr. Emmett C. Snead purchased 200 acres in 1937 from the historic Braehead mansion property located in what is now the Fredericksburg and Spotsylvania National Military Park. The grand brick residence called “Braehead”, situated on 600 acres was completed in 1859 for John Howison and his family of nine, and named after his family home in Scotland. Braehead saw a good deal of action during the Civil War, with both confederate and union troops occupying the house during the course of the conflict. Robert E. Lee is reported to have had breakfast at the house on the morning of the first battle of Fredericksburg, and the walnut tree to which he tied his horse still stands today. The house was added to the National Register of Historic Places in May 2000. Mr. Snead and his family were renting the Braehead Mansion when he purchased the 200 acres from the estate. His son Emmett C. Snead, Jr., married Jane Snead in 1950 and began a very successful dairy operation on the 200 acres. They raised four hard working farm children, of which the oldest, Emmett Snead, III, went on to start his own successful farm, known today as “Snead’s Farm” in Caroline County, VA. Mr. and Mrs. Snead delighted in having the children of the community visit, giving hay rides and letting them joyfully explore farm life. And now, the youngest, George Snead, operates the family farm as known today as “Braehead Farm”. Braehead Farm stands as the last remaining farm in the Historic City of Fredericksburg, VA. The city and the Fredericksburg Industrial Park have grown up around the farm. The dairy cows are now gone and replaced with beef cows. The dairy barn has been transformed into a farm market. 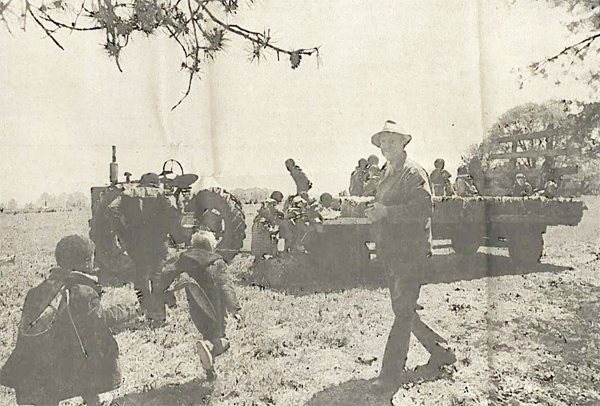 And although the farm has reduced in acreage through the years, the Snead family still remains committed to the legacy of the Snead men before them, who dreamed that it would continue to be farmed and filled with the laughter and joy of the children who came to visit and learn about farm life.